Beginning Wednesday, Call of Duty: Black Ops 2 will begin offering "personal customizations" on the Xbox 360, the game's community manager said this morning. The items don't affect gameplay—they're items like weapon skins, targeting reticles, and player calling cards. 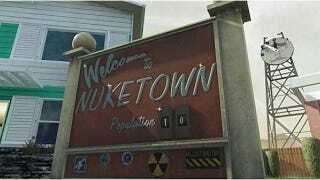 Moreover, the multiplayer map Nuketown 2025, originally a preorder incentive back in November, will be made available for free. "This content contains either personal customizations or nice little luxuries that I've seen players request," Amrich wrote on his official site. "None of them affect gameplay, but they are small, specific ways to enhance your online experience." The content comes in themed packs for 160 Microsoft Points each, and will contain a weapon camo, three targeting reticles, and a Calling Card. Additionally, Nuketown 2025 goes free for everyone on Wednesday, and Nuketown Zombies now comes as a standalone purchase for 400 Microsoft points. (It had originally been included with limited editions of the game.). Players may also purchase 10 more create-a-class slots for 160 Microsoft points, and Flags of the World Calling Cards. They're grouped by region and available for 80 Microsoft points per pack. "At the end of the day, all of these items are completely optional, and were created for players who've asked for more customization options," Amrich wrote. "If that's not you, that's fine; everybody gets Nuketown 2025 for free, so definitely take advantage of that." More information will be available on the official Call of Duty website tomorrow, Amrich said.